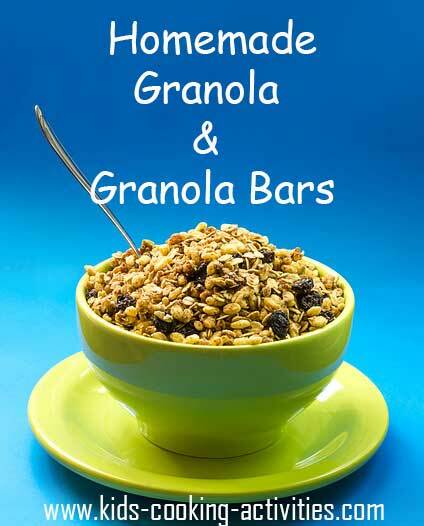 Learning how to make granola is rather easy. Once you mix your ingredients together it is just a matter of cooking it for 30 minutes- one hour on a low temperature and stirring it often. 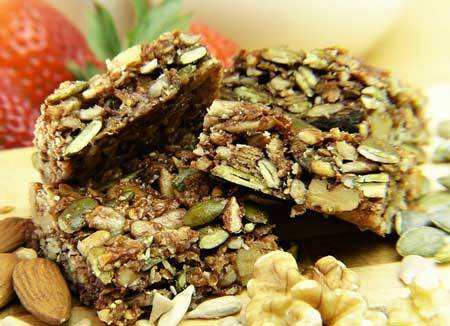 You can change your ingredients to your liking such as different nuts, different dried fruit or omit either of these. You'll be making homemade from now on! This makes a large batch that you can store in the freezer. If you don't want this much than cut in half. Preheat oven to 250 degrees. 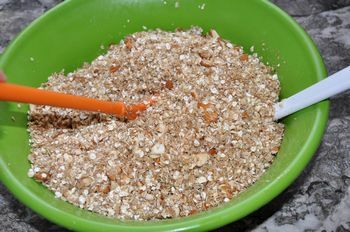 In a mixing bowl, combine oats, nuts, coconut and brown sugar. Stir in salt, cinnamon, vanilla, brown sugar, honey and oil. Stir until well combined. Pour onto 2-3 cookie sheets. Cook for 1- 1/2 hours, stirring every 15 minutes. Remove from oven and add dried fruit. 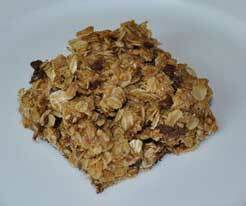 This granola recipe has a thicker texture more like cereal. It has a different flavor than the one above also. Mix ingredients together in large bowl. Spread on two cookie sheets and bake 250 degrees for 1 hour. Stirring every 15 minutes. Enjoy it with berries, yogurt or however you'd like! 1. combine oil and honey together in the bottom of a large wok. 2. Heat the oil/honey mixture for about 2 minutes on high heat. Once the oil is hot, turn the heat down to a medium setting. 3. Add oats all at once; stir the oats til coated with the oil/honey mixture. Continue to stir constantly til the oat mixture is lightly toasted. 4. Remove wok from heat; let mixture cool completely. 5. Place the oats in a large mixing bowl. Add remaining ingredients. Stir together. Put butter, brown sugar, honey, and water in a 9x13 baking pan. Turn oven on to 375 degrees and set pan inside oven to melt ingredients. Remove pan from oven when butter, brown sugar, and honey are melted, stir, then add the remaining ingredients and stir together well. Put back in oven and bake for 40 to 45 minutes, stirring every 10 or 15 minutes while it bakes. Remove from oven, let cool, and add raisins, mixing again. Let cool completely. Store in tightly sealed container in the refrigerator. Serve with milk as a cereal or as a snack. 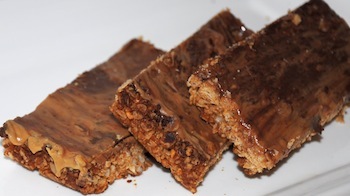 See this homemade granola bars recipe with shredded carrots! Line a 9x13 baking pan with parchment paper or spray with nonstick cooking oil. In a large bowl, mix together brown sugar, peanut butter, honey, butter, and vanilla. Turn mixture into your prepared pan and gently spread out and press down to even out. Bake in preheated oven for 15 to 20 minutes or until bars are golden brown. Remove from oven and cool in pan, then lift out, peel away the parchment paper and cut with sharp knife into snack size bars. Store in a tightly sealed container in the refrigerator to keep longer. These taste great and like the ones you'd buy at the grocery store but without all the preservatives and unhealthy additives. The trick in making them into thin and crispy bars is just pressing it down into the pan. Also using tin foil or parchment paper to line the pan makes them come out clean and unbroken. Line a 13x9 pan with parchment paper. Warm oven to 350 degrees. 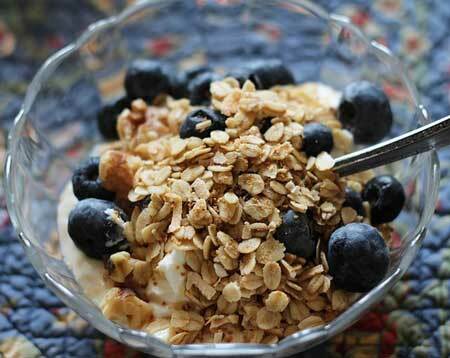 In a large bowl, mix together oats, cereal and nuts. In a separate bowl, combine together honey, peanut butter, oil, vanilla and brown sugar until well combined. Stir honey mixture into cereal mixture and blend until well combined. Add cereal mixture into pan and press down into pan to make a thin layer. Sprinkle with chocolate chips. Bake for 15-20 minutes or until golden brown. Take out of oven and with a spreader, spread melted chocolate across entire bars. Drop several spoonfuls of peanut butter across top and once peanut butter warms spread on top of the chocolate. Let cool until chocolate peanut butter sets and lift out of pan by parchment paper. Cut into bars. I like to freeze in sandwich bags for school lunches. 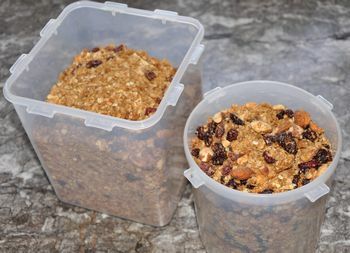 In food processor, blend granola and raisin until finely chopped. Stir in flax seed, honey and peanut butter. Pulse a few times to combine. If mixture is too dry to form into balls add in 1 Tablespoon of milk at a time until good consistency. Roll balls and then roll into shredded coconut.